This item is a Holiday online promotion and not displayed in the store at this time. All of our products are sold exactly as described and sold with money back guaranty. Availability is a subject to change. 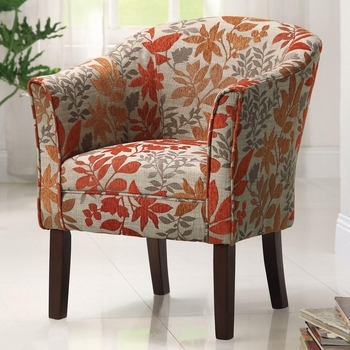 This beautiful barrel back chair is a unique addition to the living room in your home. Featuring tapered wood legs in a dark finish, with an arching back, and slightly flair arms, this chair is sleek in design. The floral upholstery adds a smart and distinctive look to a multitude of locations in your home.